Dubai, UAE, October 07, 2018: For women, the skin around the eyes and that on the lips which is naturally darker against the facial skin tone create an immensely beautiful contrast, making them look very attractive. Highlighting these areas enhances facial features even more, which is why mascaras, eye shadows and eyeliners have become make-up staples. Make-up is fun and feminine, but it also clogs the pores of the skin, making it difficult for them to breathe, leading to skin irritation, breakouts and fine lines in the long run. The more we touch our skin and apply make-up, the more we are at risk of early wrinkles, especially on the delicate skin around the eyes. Less is more when it comes to applying make-up around the eyes, however the majority of us still don’t follow that rule. And while it is important that you remove all make-up before you are done for the day, you should also do more to care for your skin. Using a skincare product such as a face mask or an eye mask can hydrate skin, remove excess oils, pull out impurities and help improve the appearance of your pores. If not daily, engage in such a healthy skincare regimen weekly. 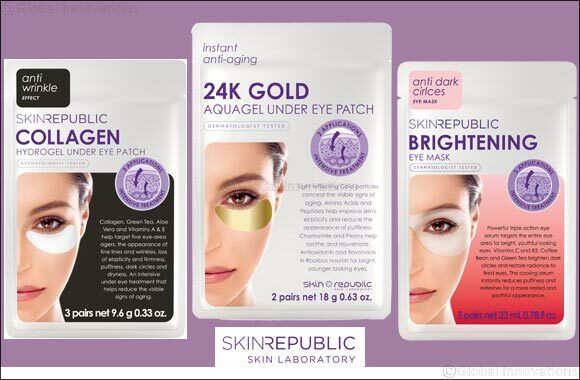 Sheet masks boost our skin with antioxidants and prevent water evaporation – providing smooth, hydrated skin and Skin Republic’s collection of eye masks offer targeted therapy for brighter looking eyes. Light reflecting Gold particles conceal the signs of ageing. Collagen and Adenosine help improve the skin’s elasticity and minimise the appearance of fine lines. Antioxidants and Phytonutrients found in Blueberries nourish for bright, younger looking eyes. A powerful triple action eye serum targets the entire eye area for bright, youthful looking eyes. Vitamin C and B3, Coffee Bean and Green Tea brighten dark circles and restores radiance to tired eyes. The cooling serum instantly reduces puffiness and refreshes for a more rested and youthful appearance. This intensive under eye treatment helps to nourish the skin and target five eye-area agers: fine lines and wrinkles, loss of elasticity and firmness, puffiness, dark circles and dryness. Active ingredients Collagen, Green Tea, Vitamins A & E and Aloe Vera help to re-energize the eye area soothing away signs of stress and fatigue. It effectively “erases” slight imperfections and helps to increase the staying power of eye make-up.